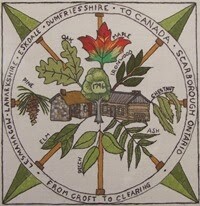 The Scottish Diaspora Tapestry will be returning to Canada in September. The exclusive Ontario stop will be in Scarborough at St. Andrews Presbyterian Church, 115 St. Andrews Road. A very informative story submitted by Lorriane Iverach of Winnipeg Embroiderers' Guild in the lead up to the Tapestry exhibit in Winnipeg in June. The Winnipeg's a Winner story about the exhibit in Winnipeg in June. The Embroiderer's Guild of Victoria has captured their progress with the panels on the blog on their website. You'll find the project posts in the list on the right side of the page. A beautiful photo from the Victoria exhibit in May; it will give you an idea of the scope of the project and exhibition. The Christ Church Cathedral Facebook page had lots of posts about the tapestry in May 2016. An article about the BC panels by Barbara Gilbert, EAC Teacher/Embroiderer's Guild of Victoria, about the exhibit. A story on the Scottish Diaspora Tapestry exhibit in Victoria.